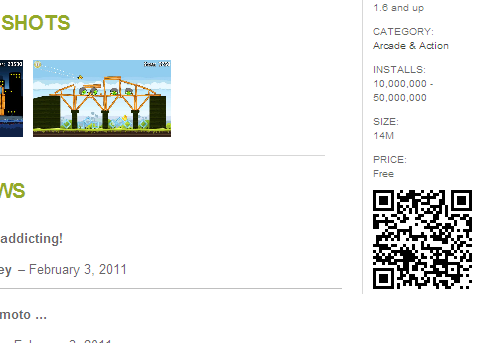 Now that the Android Market is out on the web it would be great to be able to generate a QR code right here in text box. This would allow us to stop using other websites like AppBrain for our app linking. Does anyone know if the WMD editor used here can be modified to add a tool? We can now at least use direct links to Market apps that use a normal URL scheme and will work as links on both the phone and your PC. Which should all be a lot more useful (and less confusing to the casual visitor) than sending someone to Appbrain, or the like. I don't think that's necessary. For one thing it's not a change that would be all that universal. What use would, say, English.SE have for QR codes? Besides, the new web market puts QR codes right on the page. It's only a couple of clicks to get the URL for the image and add it to a message. Not the answer you're looking for? Browse other questions tagged feature-request qr-codes market editing .